Ekema: Smiling as he is being stripped naked of academic robes? The matter of Buea Mayor, Patrick Ekema Esunge, suspected to have forged certificates to be admitted into the University of Buea, UB, is virtually headed for the law courts. Police investigations have been completed and the file is presently before the Attorney General who requested the probe upon a petition lodged with him. 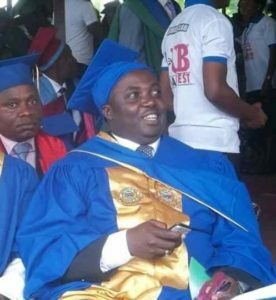 The investigations have been concluded just when the University of Buea Senate has resolved to strip Patrick Ekema Esunge naked of academic robes donned on Bachelors Degree and a Masters Degree. The UB Senate decision came after a sitting following findings of a committee that was set up by UB Vice Chancellor, Prof. Horace Ngomo Manga, to probe into the matter. Only one person tried to speak for Ekema, but the decision of the 73rd Senate of UB prevailed and was sent to the Minister of Higher Education and Chancellor of Academic Honours to revoke the UB Degrees conferred on Ekema. Decisions by the Senate, which is the highest organ of the varsity, are non-appealable. Tambe Tiku goes further to state that: “It is important not to under-estimate the gravity of the offence of academic fraud… It discourages potential students from going to school and working hard, leads to loss of respect for authority and Government and is inimical to public administration. The Judicial Police boss immediately assigned Senior Superintendent of Police, CPP Noundou, and Superintendent of Police, CP Zo’ombam, to the investigation. Meanwhile, following the allegation of fake certificates and a demonstration by students requesting Degrees awarded Ekema to be withdrawn, UB VC, Prof Ngomo, setup a committee to conduct a probe. The committee reportedly found out at the level of the General Certificate of Education, GCE Board, that Ekema registered the GCE Advanced Level seven times and actually wrote four times but got only an ‘E’ Grade in History each of the times. Ekema was expressly invited for explanation and clarification but he snubbed the committee. Back in UB, the committee searched for the application file which Ekema submitted for admission but could not find it. The committee sought for the soft copy and, bingo!!! Against Ekema’s name was entered “AL French – C and History E”, but GCE Board records did not have that. Meantime, minimum requirement for admission at UB is two papers in one sitting or at least two papers in two sittings with ‘C’ grades. This was not the case. It was thus established that Ekema fraudulently got admission into the prestigious institution. In our own prying, which took us to several quarters, The Post could not lay hands on the supposed ‘A’ Level document Ekema used or the file. It is apparent that after the fake certificate story was published last year, and further investigations opened, he or his sympathiser quickly went and withdrew it. However, if the matter finally lands in court, the onus would be on him to show the ‘A’ Level document which he presented to secure admission at UB. According to our findings, the Judicial Police finished their investigation and sent the file back to sender. It, however, came after the sender, the then Southwest Attorney General, Justice Emile Essombe, had been appointed member of the Constitutional Council and now in Yaounde. The file, presumably, met but the acting Attorney General, Justice Maurine Chibili. Many observers hold that in a country where the rule of law prevails, all what Ekema earned predicated on the fake certificates would be refunded. Tambe Tiku, Human Rights activist told The Post after the UB Senate resolution: “The State should have an interest in the matter because he introduced fake certificates to be raised from Category 7 to Category 8 and earned money at that level. The State should ask for a refund without prejudice to the criminal charges. Section 132(2) states that the penalty becomes imprisonment for from one year to six years where the offender is a public servant. There is no provision for payment of fine as punishment in this section of the Penal Code.